There must be thousands of blog posts and articles out there about the debate HTML vs Flash. Apple recently published a page here showing the world a demo of what HTML5 can do. It’s very interesting. Flash has been around for awhile and a lot of people have spent endless hours learning/developing around this it’s understandable that people have resistance to change. I don’t code for a living, productivity isn’t a concern therefore I like trying new things. 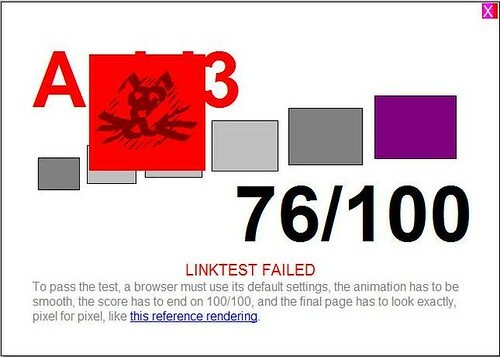 I don’t like Flash, a poorly designed site using Flash can easily put customers away, e.g. the Nike+ site, the original one is terrible the updated one is slightly better but still a CPU hog. The latest competitor to Nike+ is Adidas’ miCoach their site is also built on Flash since it’s pretty new so it’s less CPU demanding and better looking in my opinion. 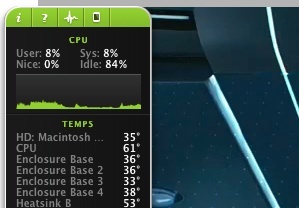 I have just tried Apple’s demo page (Safari only) and watched the short video the CPU usage is below 10% in my late 2009 MacBook Pro 13″. Is this good enough for a beta? Chrome has the simplicity I like on the outlook. It doesn’t come with the font rendering I like in Safari but I think in due course those eye candy features will come either in the core or from plugins. At first start up it didn’t impress me because it took a long time to render Google’s personal home page and crashed. Once a few pages are cached it was alright. In Task Manager I see few instances of Chrome, one for the chrome itself then one for each tab. There is also one for default functions such as shockwave flash etc. You can try ending those processes one by one and you’ll know what has been terminated and taken away. I have yet to see if it may suffer memory leakage so I’ll start this for the whole day. Edited: I think Google is ready to show off. Chrome has its own Task Manager (press Shift+Esc) below and you can see which process is consuming how much. It’s like Windows’ Task Manager and you could end any naughty process that may be causing problem. 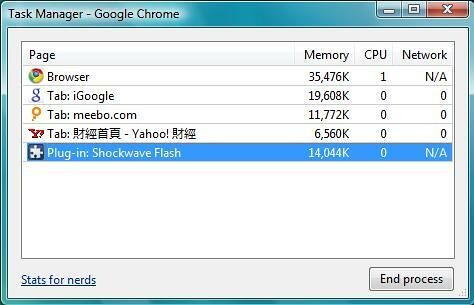 Try open a new tab and enter ‘About:memory’ in the address bar you’ll see more about memory usage. Google is ready to show off, i.e. putting Chrome side-by-side with other browsers running. They know you’ll be comparing are you not doing that right now? As a developer can you cope with the pace of new broswers and standard? Google is launching their own browser very soon. It’s like a car builder now having their own engine factory. I have seen commercial sites around here still WARNING users that their site is best viewed by IE 5.1 or 6 while IE7 is nearly obsolete with IE8 just round the corner. 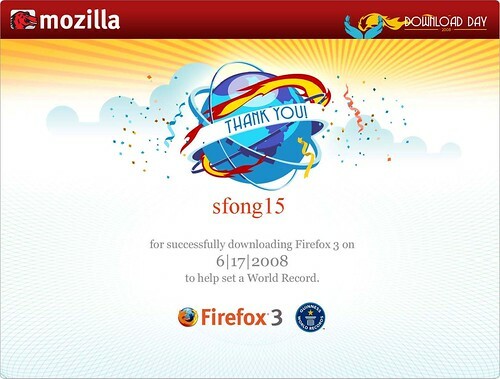 I have also seen websites still support only IE without any consideration of users using Safari, Firefox or Opera. I guess with the pace of new broswers/standards joining the race it must be good business helping businesses to update their website designs.